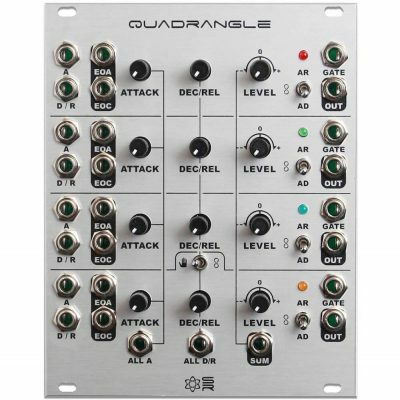 The Quadrangle is quad cascading triggered envelope generator with bipolar output attenuversion. Each channel has voltage control over attack and decay/release, end of attack and end of cycle trigger outputs, and mode (AR, loop and AD). Each channel’s EOC is normalled to the next gate input, resulting in interesting rhythmic opportunities. Channel 4 has a “stop” or “continuous looping” switch which allows either a “one shot” cascaded envelope or continuous cycling. The SUM output allows for longer and more dynamic bipolar envelopes, perfect for interesting modulation. Users also have voltage control over all of the attacks and decay/releases simultaneously when using the ALL A and ALL D/R input jacks. Massive function generation, modulation, rhythm and versatility sets the Quadrangle in a class of its own.